Complementary & Holistic therapist Diana Smith has trained for more than 15 years and continues to study within the field of Energy Healing. Her Masters have been varied and exceptional in their specialities. The principal influences in her life come from Spirit and Nature, meditation being the cornerstone. She is motivated by her quest to find the Truth. As an accomplished Reiki and Energy Healer, Psychic and Teacher incorporating wisdom and teachings from various schools to facilitate healing, Diana offers individual consultations and draws on her wealth of knowledge and training. 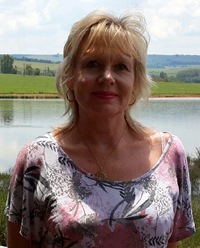 Diana comes from Cape Town, South Africa and is the proud mother of two sons. She is currently in Ireland studying The Hidden Mind program and Bio Energy with Tom Griffin. The client is able to access healing vibrations from the universal life force energy. Diana has been attuned in Reiki Usui, Reiki Jin Kei Do and Reiki Buddho and Gaea Natural Healing. Her focus is on facilitating healing and training at a high level which is about substance. Each healing favours depth and integrity. Distance Healing or Absentee Healing is established through Symbols. Absentee treatments act more quickly than hands on treatment and in many cases can be much more powerful. A Symbol can be compared to a magnifying glass that focuses light rays into one point of intense energy. When the mind is focused to one point by the use of the Symbols, the flow of energy is sharply focused and has more intensity and power. This is especially true of distance healing where the energy is transmitted through time and space to connect with a specific individual. Healing energy is received by the spiritual/mental body of the receiving person and flows through the emotional and etheric bodies to the physical body, healing all five bodies. This Energy vibrates at a higher vibrational frequency then the physical body and instantly connects with the pure consciousness of the spiritual/mental body of the receiver. Since everything is energy, all healing ultimately involves energy. Most healing methods are focused on the physical, mental and emotional levels of life, without recognition of the deeper underlying energy. Energy healing works purely with the energetic level of our being. Since everything is made up of patterns of energy, working directly with energy influences the physical, mental and emotional as well as the spiritual level. Energy healing is thus by nature "holistic". If there is an illness or disturbance in the body, mind or emotions we certainly want to address those levels. Energy healing however complements and supports other methods of healing because it addresses the energy of which the body, mind and emotions are composed. Energy healing employs spiritual healing methods which expand awareness of both the energy healer and client by using energy, colour and light healing techniques to catalyse healing in the patient's energy field (aura and chakra system)-helping the patient break free from afflictions and limitations of body, mind and spirit. It may provide enhanced quality of life for the patient and facilitate spiritual growth. Energy healing is a powerful, non evasive form of healing which can be given both in person and via distance healing utilising sound, crystals and symbols. Often, the blockages or issues we have to deal with in this lifetime have their origins in prior incarnations. By accessing these memories, we can release the patterns that no longer serve us, freeing us to live more fully in the present. Since we have lived hundreds, if not thousands of lives, it's no wonder that we carry so many imprints or energetic charges from past lives into this lifetime. If we don't heal and release these patterns we will very likely continue to carry them into future lifetimes, thus restricting our spiritual growth and evolution. They can be vows made, accomplishments, mistakes, emotional debts, guilt, trauma, love, sudden deaths and grief unhealed. When a particular pattern, fear, anxiety or behaviour is continually triggered and repeated in our present life, interfering and affecting our relationships, ability to perform and even our physical health it may feel intuitively important to access the memories from the past, then a Past Life Regression process can be used to access and heal the wounding from you past, in the present. Positive patterns can feed talents, direct wisdom, influence tastes and energise life purpose. Negative patterns fuel destructive, compulsive behaviour, cloud judgement, cause injury and block progress. I guide the client into a very relaxed state so that they can experience the memory as a fully sensory experience. Often the client can "see" everything as if it were a movie and experience smells, sounds and emotions. Experiencing yourself as a soul in other lifetimes gives you a profound awareness that you are more than your physical body. You encounter your soul's essence, connected and aligned to a greater universal energy. Past life regression is the process of healing the soul by healing the past. It is a truly peaceful and reassuring process. As a spiritual healer, I look at the spiritual form of illness which might manifest on an emotional or physical level. As people we have all experienced a feeling of having 'lost a part of ourselves' to something, some person or even some place! The ancients believed that soul and body could part, and that under great emotional stress, the soul would actually leave the body. When the soul experiences trauma, pain, tragedy or great fear, it often splinters small pieces of itself, or sometimes big chunks off, and leaves them behind, or carries them along close by, yet, disconnected. Think of your soul as your mirror image looking back at you while you look into the mirror. A sudden impact breaks the mirror, it shakes, some pieces fall off and scatter. They may land on the counter or down on the floor below. Now the mirror is marked by cracks with chunks missing and the image looking back at you is fragmented. The shattered pieces are still nearby as you stoop to gather them up. A Soul Retrieval is like finding the pieces of the mirror that have gone missing and restoring them. Looking into the mirror you see your reflection as whole, complete and the "soul" pieces are visible once again. Through this process you can now heal and move on from the trauma to live a fuller, happier life.